Two-thirds of children entering primary school in 2016 are likely to find themselves working in jobs that do not yet exist. This new environment of technological, demographic and socio-economic disruption is transforming industries and reducing the shelf life of workers’ skills, according to the World Economic Forum’s Future of Jobs report. Researchers find that as the employment landscape changes, it becomes more important for businesses and workers alike to keep skills relevant and up to date. Some of the most in-demand skills today did not exist as recently as 10 years ago. In fact, the pace of change is so fast that it’s easy to fall behind. 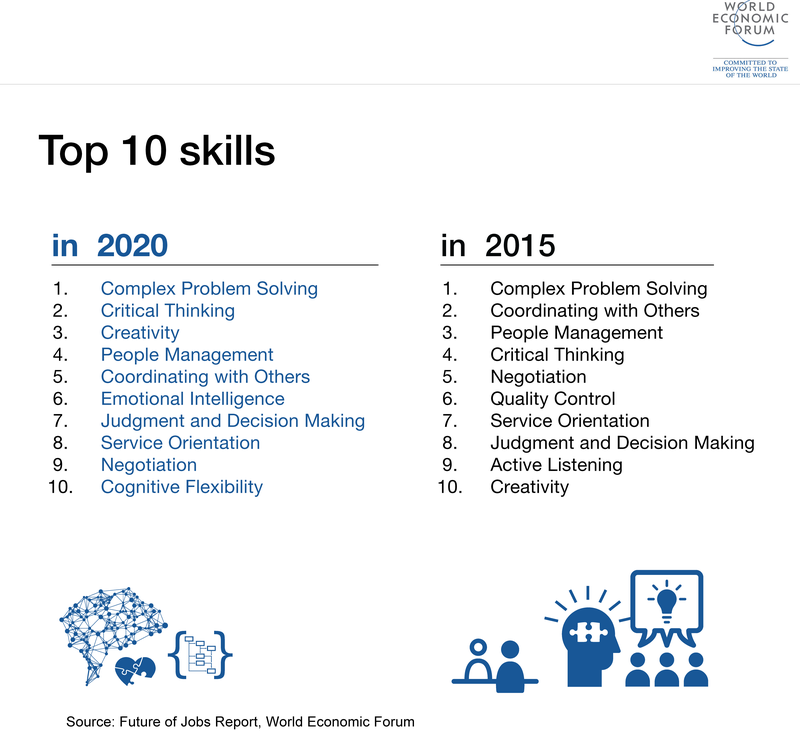 The chart below shows the rise and fall of the job market's most popular skills, with the demand for creativity and the ability to negotiate expected to increase dramatically over next four years. It's estimated that by the year 2020, “more than a third of the desired core skill set of most occupations will be comprised of skills that are not yet considered crucial to the job today”. Creativity and critical thinking, for example, will be required by more than a third of all jobs in 2020. Whereas physical strength will only be valued in one in twenty jobs. 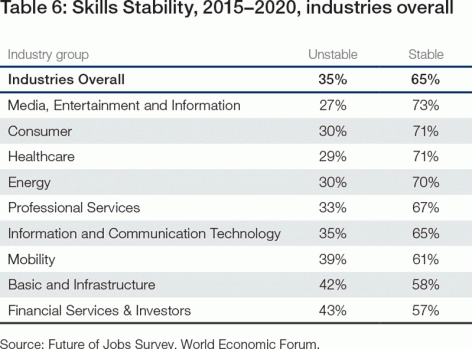 Some industries are more at risk of skill instability than others. The Financial Services and Investors sector is likely to see the most disruption, with more than 40% of the skills currently needed to perform well in the industry soon becoming redundant. This chart shows which job sectors have the highest turnover of skills – or put more simply, which jobs will take the most retraining just to keep up. So, in which areas will you get the most mileage out of your skills? Media, entertainment and information are the best placed, with almost three-quarters of the skills currently required to be good at your job likely to still be relevant in 2020. The Future of Jobs report highlights that our ability to anticipate future positions and identify the skills we'll need to get them, is critical if we're to survive job disruption over the coming decades.